In Spain, – Las doce uvas de la suerte – The twelve grapes of luck – is a Spanish tradition. It’s thought that eating one grape with every strike of the clock at midnight brings good luck for the New Year. It’s definitely more than a mouthful, trust me, I tried while living in Andalucia many moons ago. 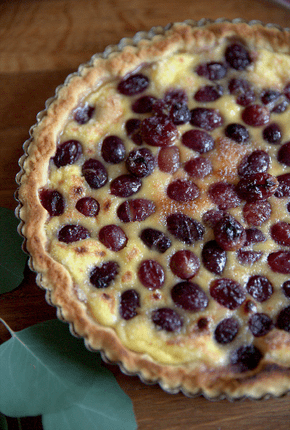 This sinful delicious Spanish Grape Tart lets you eat all 12 grapes in just a few sweet bites. Prick the grapes with a fork and place in a large bowl. Add sugar and mix well. Cover and set aside to macerate at room temperature for about 3 hours. For the pastry, combine the flour and salt in a large bowl. Cut in the chilled butter with a pastry cutter or 2 knives, until the mixture resembles coarse crumbs. Add 2 tablespoons of ice water, one spoonful at a time, and mix until the dough holds together. Form into a flat disc, wrap in plastic wrap, and refrigerate for at least 1 hour. Preheat the oven to 350°F. Roll the dough into a 12-inch round on a well-floured surface. Place into a 9-inch tart pan with a removeable bottom. Trim the edges, allowing a 1⁄2-inch overhang, then fold over and crimp. Drain the macerated grapes and scatter them in a single layer on top of the pastry. Bake about 40 minutes, until the crust begins to color. Mix together the eggs and crème fraîche in a small bowl. Pour the mixture evenly over the grapes and continue baking about 10 more minutes, until the filling begins to set. Sprinkle 2 tablespoons of sugar on top and bake about another 10 minutes, until the filling is lightly browned. Cool slightly before serving. Chef’s note – I love the savory notes of rosemary and lavender with grapes. Try adding 1 teaspoon of chopped rosemary or 1 teaspoon of crushed dried lavender in this pastry or a ½ teaspoon each mixed together for an herb-infused tart crust.